Sometimes facing a new week is hard. It’s exhausting. Maybe you’re sick or dealing with a difficult health problem. Maybe your finances are not stretching far enough to meet your bills. Maybe a relationship that’s important to you is faltering. It can feel very overwhelming. 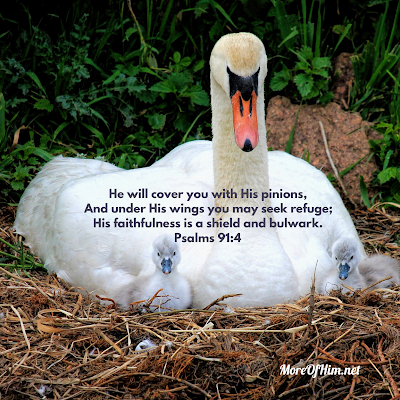 God promises to shield us. When I was going through my health problems, this Scripture gave me such peace. I could imagine God covering me and protecting me...just as He is doing for you. He places us in the soft nest of His assurance. He shields us with the strength of His truth. He is with you today and throughout this week. Snuggle in, my friends, close to our Savior who loves you. Beautiful encouragement, sweet friend. Thank you so much!